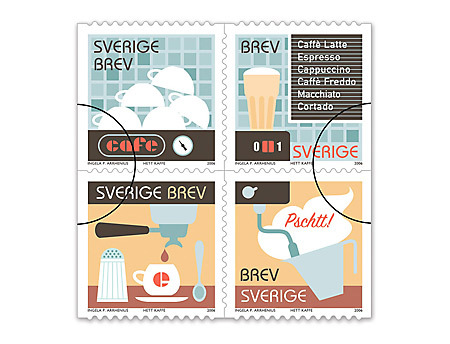 You know coffee is big when they design stamps with coffee related images. Design by Ingela Peterson Arrhenius. Not bad at all imo. Did you know we have the best coffee in the world? Nice quote: " We don't only drink coffee because it tastes good but because it's a large part of our social life ". Want to know more - check out the European Coffee Report. Content updated 10 March 2019. <URL: http://boralv.se/blog/?id=1146753627>. This server is able to calculate 31.3 pages like this per second. No computers were harmed in the making of this page. CSS Validator, HTML Validator.